The happiest managers after Manchester United and Liverpool slugged to a 1-1 draw on Sunday were not on the benches at Old Trafford. In the breathless six-way race at the top of the Premier League, three of the pace-makers had kept surging on Saturday. Tottenham crushed its jinx team, West Brom, 4-0. Arsenal, helped by two own goals, dispatched hapless Swansea, also 4-0. Chelsea, the leader, cruised past the champion, Leicester, 3-0. The draw on Sunday, combined with Manchester City’s loss at Everton, meant the three London clubs all gained ground. 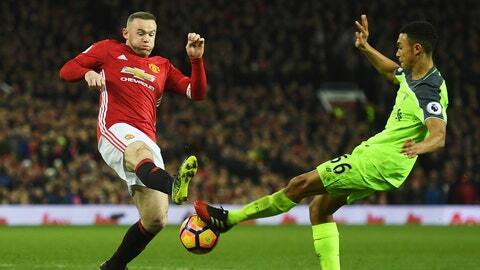 Manchester United and Liverpool produced a scrappy match in which both struggled to cope with the size of the occasion. Liverpool also struggled with the size of its opponents, although its best moment was a result of Paul Pogba’s inability to cope with the bigger Dejan Lovren. For an hour, Manchester United bullied Liverpool. Yet United could not take its chances, and Liverpool led. Henrikh Mkhitaryan, twice, and Paul Pogba, once, broke clear. Pogba shanked his attempt. Mkhitaryan shot to close to Simon Mignolet the first time then opted to pass to Anthony Martial the second time but hit the ball too hard. Mignolet also made a strong-wristed save from a ferocious Zlatan Ibrahimovic free kick. After an hour, Liverpool had managed only one shot on target. That was a 27th minute penalty. The penalty was the culmination of the problems Pogba was having dealing with his man, Lovren, at corners. After being beaten twice, Pogba leapt for the third corner with his back to the ball and his arms in the air, the ball hit his hands. James Milner smashed the spot kick past David De Gea. Jürgen Klopp brought on Philippe Coutinho. He calmed the ball and his team-mates, almost immediately setting up a dangerous chance for Firmino who forced the first save of the game from De Gea. While Klopp’s change worked well, Mourinho last switch worked even better. The United manager sent on Marouane Fellaini with 16 minutes left. United were going to boot high balls into the goalmouth. Eight minutes later, the tactic paid off. Fellaini nodded against the post. Antonio Valencia lobbed the ball straight back and Ibrahimovic headed it over Mignolet. Liverpool, lacking Joel Matip and Nathaniel Clyne, had defended doggedly but finally cracked. North West, London dominate Premier League's top six, but which region rules? Klopp seemed outraged that United had salvaged a point with such crude tactics. “We were the better side, played better football had the better plan,” the Liverpool manager told Sky. “In the last 20 minutes United only long balls,” Klopp complained with a shrug. Both managers said they would have preferred to win but that a draw was better than a loss. The draw dropped Liverpool to third, behind Tottenham on goal difference. More importantly it fell seven points behind Chelsea. United stayed fifth, 12 points behind the leader. On Sunday, locked in their usual brawl, neither looked likely champions. GOODISON JOY For Everton fans there was plenty to savor as their team beat Manchester City, 4-0, on Sunday. There was the result itself, the biggest defeat ever suffered by a Pep Guardiola team. 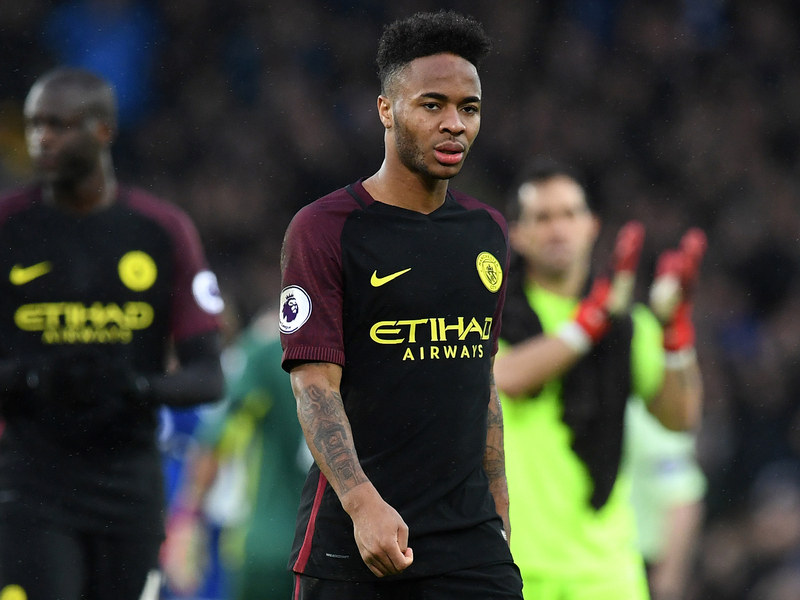 There was the joy of taunting two men who had been lured away from Merseyside by the Emirati millions and the promise of trophies: a former Liverpool player, Raheem Sterling, and a former Everton player, John Stones. Stones had a nightmare afternoon summed up in the closing seconds when he whacked a clearance against Seamus Coleman. The ball rebounded to Ademola Lookman, a 19-year-old who had just come on for his Premier league debut. He coolly scored his first Everton with the last kick of the game. Stones was not alone in having a miserable afternoon. Lookman's shot went through Claudio Bravo’s legs. It meant the goalie had conceded four goals from four shots on target. Lookman is a Londoner bought from Charlton. The Premier League man of the match was a Liverpudlian who is a year younger. Tom Davies is one of Everton’s own. His display signaled that he is the latest product of the club’s youth system who could fulfill the hopes that Wayne Rooney took with him when he went to Manchester. The previous great Everton hope, Ross Barkley, now 23, has had another up and down season, but he probably managed two assists. The second set up Davies for what might be his first Everton goal. Davies, an energetic midfielder, picked up the ball deep in his own half, accelerated up the right, beat two defenders, passed to Barkley, just before he was knocked over. Davies bounced up and started running again, collected a return pass and clipped the ball over Bravo. Romelu Lukaku chased the ball toward the goal and flicked a boot at it as it crossed the line. Davies said after the match that Lukaku insisted he had touched the ball. The cameras suggested that if there was contact, it was extremely slight. The result meant City dropped out of the top four. It cemented Everton’s grip on seventh. But, still 11 points behind fourth, the most it can realistically hope for is to finish best of the rest this season. Yet Sunday afternoon offered a glimpse of potentially glorious future. STRIKERS There were two star absentees in Saturday’s Premier League schedule. Dimitri Payet did not appear for West Ham against Crystal Palace after Slaven Bilic, said that the Frenchman wanted to leave and had refused to play for the club again. On Saturday, neither was missed. Chelsea gave a mesmerizing attacking display as it won, 3-0, at Leicester. Who needs Costa, Chelsea fans might ask, when we have Marcos Alonso. The wingback scored the first two goals, but the stars were Eden Hazard, who notionally played central striker, Pedro and Willian. Leicester attempted to mirror the Chelsea formation. The problem was the home players simply were not good enough to cope with the ceaseless movement, deft ball control and slick passing of the Chelsea trio. West Ham, meanwhile, had lost three straight, the last a five-goal home humbling by Manchester City eight days earlier. Facing former manager Sam Allardyce and his non-functioning Crystal Palace team was just what the Hammers needed, though it took until the second half for the 11 men who were prepared to play for the club and the 57,000 crowd to wake up. Andy Carroll added to this season’s collection of spectacular strikes with an aerial overhead strike that combined athleticism, skill, power and a jaw-dropping levitation of his 6-foot-4 inch, 170-pound frame. After Olivier Giroud scored with a scorpion kick On New Year’s Day, also against Palace, his manager, Arsène Wenger, suggested that, in theory, any park player could score such a goal. On the other hand, most Sunday scuffers would risk serious injury even attempting to imitate Carroll, and few could get their feet that far off the ground. Perhaps more telling was West Ham’s third goal, finished cutely by Manuel Lanzini, a skillful Argentine midfielder who has labored quietly and elegantly in Payet’s shadow. Costa earns a reported £185,000 ($225,000) a week basic salary at Chelsea with a contract that runs until the end of the 2019 season. According to British media, Chinese clubs are prepared to pay the player anywhere between £550,000 and £800,000 a week. His agent, Jorge Mendes, has been spotted in Tianjin, though he represents an awful lot of players, the majority of whom would be happy to earn £550,000 a week (as would most of the Chelsea fans who are so angry with Costa). After the victory at Leicester, Conte told the media that Costa was suffering back pain. That is both a very unpleasant problem and one that is notoriously difficult to diagnose. Conte’s sideline demeanor suggests he is probably explosive on the training ground. “China” is perhaps the politest place he tells recalcitrant players to go. Payet, meanwhile, has been linked with Olympique Marseille. That club has long been fabulously badly run, but it seems unlikely even OM could imagine it can afford to match his £125,000 weekly salary. On the other hand, Marseille is by far the most popular club among non-white, non-Parisian French fans and it is where Payet played before joining West Ham. So, maybe this is about love, not money. On the other hand, there are also reports that Chelsea has been cooing in his direction. If so, it would not be the first time that Roman Abramovich’s cash has destabilized players at other clubs. In a way, the Costa case is karmic payback. WILLING AND NOW ABEL Somewhere Mike Phelan was watching with a wry grin. Against Bournemouth on Saturday, Hull again started by giving away a dumb penalty, the 10th it has conceded in a season of suicidal defending. Yet, after that, Hull , for once, rode its luck at the back. At the other end the Tigers finally turned energetic attacking soccer into goals. The appointment of Marco Silva, who replaced Phelan on January 5, coincided to the return, after a 10-match absence with injury, of striker Abel Hernández. He scored in Silva’s first game, an FA Cup victory over Swansea. On Saturday, he struck twice as Hull won, 3-1. The Uruguayan striker is turning the Portuguese coach into an instant genius. JOEY DANGER Things happen when Joey Barton is around. If you are an opponent, or even a team-mate, he doesn’t like or wants to tease, you better not turn your back. He is good enough to have played for England, once, but such a handful that clubs often give up on him. The problem is not that he is self-destructive. He’s simply destructive. He doesn’t just express that with butts, punches, kicks and burning cigars. He is also extremely articulate in expressing his dissatisfaction, as he showed when he talked his way out of Glasgow rangers earlier this season. He is the extremely smart kid with a short attention span and an even shorter temper. One place where he remains popular is Burnley where he appeared in 38 games as the club was promoted last season. His return was almost blocked by a Scottish investigation into gambling on soccer, which is banned. The probe listed 1,260 bets, though Barton allegedly were made them over a 10-year period. Return he did. Five minutes after coming on against Southampton on Saturday, Barton shoved all his teammates away to take a free kick. He scored. Burnley won, 1-0. Things happen when Barton is around.